After a peaceful Eid holiday, violence surged in occupied Hebron today. Earlier today Israeli forces shot and killed Moussa Mohammed Khaddour, 18 and injured his fiancé Raghad Abdullah Abdullah Khaddour. The couple allegedly tried to ram settlers from the illegal israeli settlement of Kiryat Arba, at the entrance of the settlement. Moussa Khaddour was killed at the scene, while Raghah Khaddour were severely injured and taken to a medical facility. Elsewhere in Hebron, in the H2 neighborhood of Tel Rumeida, a young Palestinian man was shot dead by Israeli forces, the Palestinians identity is still unknown. The young Palestinian man allegedly tried to stab an Israeli soldier near the Gilbert checkpoint close to an illegal settlement in Tel Rumeida. The Israeli soldier suffered a minor wound in the face and was taken to a medical facility. Information about the incident is scarce, but testimonies from witnesses hearing the episode indicate that it might have been a extrajudicial execution. Locals explained ISM how they first heard 3 shots, and several moments after, heard 2 more. After the killing of the Palestinian in Tel Rumeida, the whole neighborhood was declared a closed military zone, and the checkpoints leading in and out of the area were zealed off, preventing Palestinians from entering or leaving the area. The closure of the Tel Rumeida neighborhood created an assembly of Palestinians outside of the Shuhada street checkpoint, wanting to pass the checkpoint. The assembly subsequently led to a confrontation with Israeli forces. 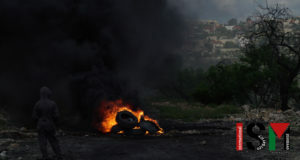 Palestinian youth threw glass bottles and stones and the checkpoint, approximately twenty Israeli soldiers and borderpolice responded by invading the H1 area. The Israeli forces threw a dozen stun grenades and fired tear gas into the Bab’a’zawie area just outside Shuhada street checkpoint. During the two hour long confrontation, three Palestinians were hurt with rubber coated steel bullets fired by the Israeli forces. Hours after the confrontations the checkpoints were still closed, blocking Palestinians from entering or leaving Tel Rumeida. 224 Palestinians have been killed by Israelis since october 2015. Some of the killed Palestinians tried to attack Israeli forces, while others were alleged to do so. In many of the cases Israeli forces have carried out collective punishments on the slain Palestinians families, by demolishing their houses, and hitherto leaving them homeless, actions illegal under the Geneva convention. Several cases have also raised suspicion of extrajudicial killings, where attackers have been killed when they did not pose an immediate threat or could have been arrested through non-lethal methods.